By	Allyson Haymaker. Last edited by Marios Alexandrou on November 6, 2018. While exploring northwest Arkansas, we were pleased to discover the Daisy Airgun Museum in historic Rogers. Just walking through the door brought back long-forgotten memories. My husband remembered his first Daisy BB gun, and I recalled “borrowing” my brother's gun and being thrilled that I didn't “shoot like a girl”! But as the museum's timeline shows, the history of the Daisy airgun goes back much farther than that — all the way to 1888. 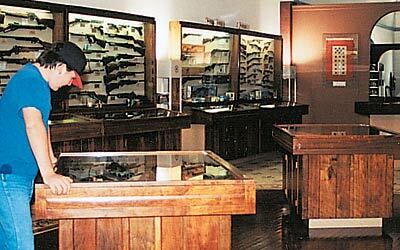 There are beautiful displays of memorabilia and over 150 airguns, some dating back to the 1700s. We finished our tour with a visit to the gift shop, which is packed with everything from slingshots to Olympic competition rifles. We came home with two Buck BB guns for our sons, so they can start making their own memories. Rogers is on U.S. Highway 71, about 20 miles north of Fayetteville, just south of the Missouri state line. The museum is open from 10 a.m. to 5 p.m. Tuesday through Saturday. For details, call 1-501-986-6873 or visit www.daisymuseum.com.